Israeli forces abducted a former Palestinian detainee, predawn Saturday, after ambushing him in occupied East Jerusalem, in the central West Bank. 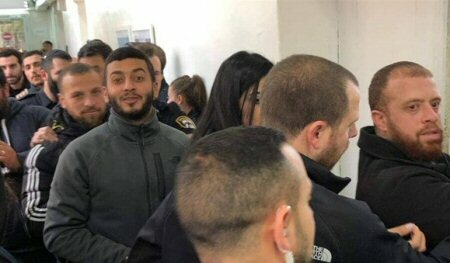 Sources told Ma’an News Agency that Israeli forces ambushed former prisoner Rami al-Fakhouri in the Wadi al-Juz neighborhood of the city, and that both Israeli soldiers and intelligence forces were deployed in the neighborhood for more than an hour-and-a-half before seizing al-Fakhouri. Al-Fakhouri was married to the daughter of a slain Palestinian, Musbah Abu Sbeih, whose body is still withheld by the Israeli authorities, three weeks ago. The wedding party had taken place in the al-Eizariya town, east of Jerusalem. An Israeli TV channel broadcast footage of al-Fakhouri’s wedding party, directly incitement against him and the guests of his wedding. The TV channel also referred to an attack that Abu Sbeih, the bride’s father, had carried out in Jerusalem City, and in which he was killed by Israeli forces. The detainees’ lawyer, Khalid Zabarqa, said that several of the detainees were released, while the detention of others was extended.